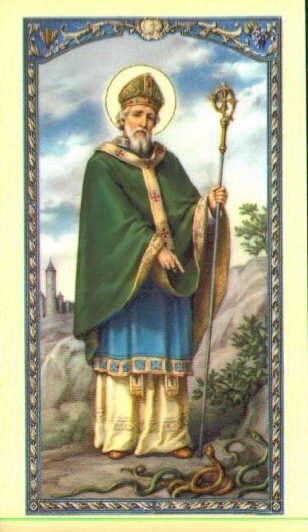 I have a great love for St Patrick, nurtured as a child in a Parish that had only ever know Irish missionary priests. St Patrick’s Day in our Parish began with Mass where each year “Hail Glorious St Patrick, Dear Saint of Our Isle.” was sung, and every child in my class turned to stare at me during the chorus, “When Erin’s green valley’s bestowed a sweet smile.” The whole day was a celebration of Ireland’s greatest Saint, culminating with a St Paddy’s Day Fete in the evening, concluding with Danny boy sung to our sweet Irish priest, whose name was ‘Danny.’ Reflecting now on these amazing sons and daughters of Ireland who left their country to come to Australia, for the love of God, I am awed and humbled. Of course it was inevitable that I would name a son Patrick, so today was Jack Jack’s Name Day (his middle name), and he was a very excited little boy. The children were pleased to do some colouring and listen to St Patrick stories. I was keen however to find a suitable way to celebrate with food as since going grain free we haven’t done any family baking. 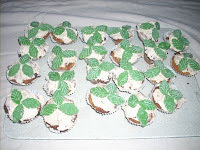 Using Catholic Cuisine’s Shamrock Mint Cupcakes as a jumping point, we ventured into the world of coconut flour and made Coconut Cupcakes and Chocolate Cupcakes. I made a few alterations with the ingredients; oils, agave nectar and the icing. The results were successful and the children delighted. Happy St Paddy's Day to all! !